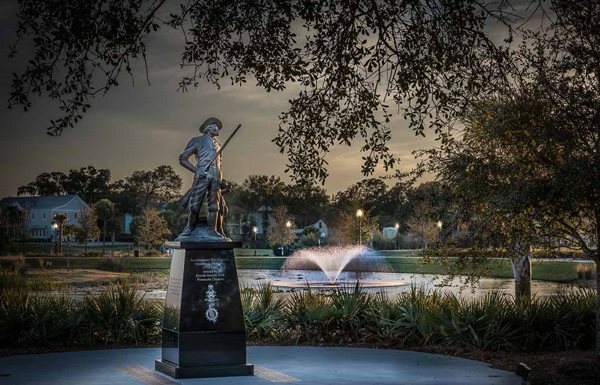 The Pensacola chapters of the Sons and Daughters of the American Revolution will host a Minuteman statue dedication Saturday May, 7th from 2 to 3pm at Veterans Memorial Park. A commemoration of the Battle of Pensacola will take place at Sailing Center at The Pensacola Yacht Club at 1897 Cypress Street from 4 to 5:30pm. Reservations are required for the reception and can be made by emailing [email protected]. Minutemen were colonist citizens who trained themselves and organized militias during the American Revolutionary War. They were named for their readiness to fight in a minute's notice. British forces seized territory in Florida in 1762 in the French and Indian War from Spain who had been settled in Florida for a century. Spanish and American forces came to take it back during The Battle of Pensacola that began on April 30, 1781. A hurricane drove Spanish ships retreating to safer waters as Spanish and American forces on the ground were on their own. Twelve days of fierce trench warfare brought British fortifications under siege. On May 10, 1781 a white flag was raised by the British at Fort George. 200 Redcoats were killed and over 1,100 were captured. The Battle of Pensacola was a key victory in defeating the British strategy of dividing the South in the American Revolutionary War. American forces then beat Cornwallis at Yorktown in October of 1781. These two battles were instrumental in stealing British politicians' will to continue fighting the war.